Notes: Mike Sexton is a guide out of the Reno Fly Shop. He came up with this pattern when he was a member of the US Fly Fishing team. Through international competition, Mike became familiar with Czech Nymphing and adapted this variation of the Twenty Incher for Czech Nymphing purposes. The Peacock Herl is chenilled with three strands and wrapped throughout the entire body, I use a single strand of herl for the collar behind the bead. You could use a dubbed underbody if you prefered to build the body up. Medallion Sheeting is used for the wingcase (Mike originally used the leather back from his lounger) and the legs are rubberlegs, rather than partridge, providing plenty of durability and action within fast moving water. There are a number of synthetic peacock chenilles available that can provide additional durability. However, none of these synthetics can provide the irridescence and fine hair-like qualities of the peacock herl. The pattern is heavily weighted with the tungsten bead and the leadfree wire wraps. Use this pattern in combination with another medium weighted nymph within riffle drop-offs and pocket water. 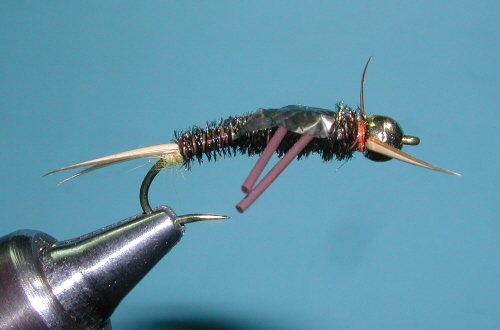 This pattern is considered a heavy nymph so is often the fly that is bouncing the bottom with a multiple fly rig.